For over 20 years Steelhead Marine has provided the global yachting market with exceptional quality cranes. A leader in innovation, design and adaptability, Steelhead can satisfy the most demanding situations. Steelhead Marine products are at the forefront of innovation in the global yachting market. 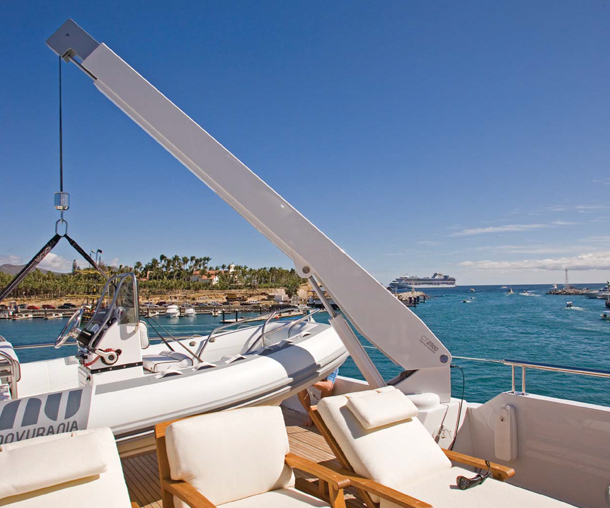 Their yacht cranes are recognised by many of the world’s leading boat builders. Steelhead Marine has been offering specialised yacht cranes based on technological advancements in materials and construction practices inspired by the aerospace industry since 1997. Proteum sells Steelhead Marine yacht cranes. We work with a range of clients which include boat builders, designers, operators and owners. Proteum offer a one-stop-shop for new engine sales, spare parts and servicing. Please contact the Proteum team today to discuss your requirements or fill in the Enquiries Form and we will get back to you as soon as we can.